The Neoss ProActive® surface was developed to improve the early healing response assuring better clinical outcome in challenging cases including stable long term marginal bone levels. The Neoss ProActive® surface is produced by subjecting the commercially pure titanium implant to a multistage blasting, etching and super hydrophilicity treatment, which enables the implant to achieve a high level of wettability. As a result, Neoss ProActive® Implants have a super hydrophilic surface demonstrated by an immeasurable low contact angle. The Neoss ProActive® Tapered Implant has a low surface roughness flange (Sa <0.4), and a medium rough threaded body (Sa 1.0). The rougher surface on the threaded implant body stimulates bone to form more rapidly and with greater strength at the implant surface, allowing for earlier loading protocols. 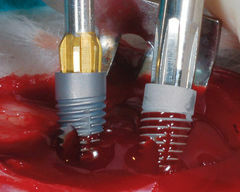 Manufacturing, storage and handling all contribute to surface contamination of a dental implant. 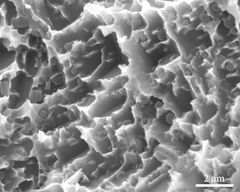 Carbon adsorption reduces surface energy and wettability, thereby impairing healing and bone formation. The Neoss ProActive® production process and packaging minimizes the already low carbon content on the surface, maximizing surface energy. 1. Gottlow J, and Sennerby L. Influence of surface and implant design on stability of five commercial titanium implants. A biomechanical study in rabbit. AO Meeting 2010, poster 83. 2. Zumstein T, Billstrom C, and Sennerby L. A 4- to 5-year retrospective clinical and radiographic study of Neoss implants placed with or without GBR procedures. Clin Implant Dent Relat Res, 2012. 14(4):480-90. 3. Andersson P et al. A Retrospective Study on Immediate Placement of Neoss Implants with Early Loading of Full-Arch Bridges. Clin Implant Dent Relat Res, 2015. 17(4):646-57. 4. Zumstein T and Sennerby L, A 1-Year Clinical and Radiographic Study on Hydrophilic Dental Implants Placed with and without Bone Augmentation Procedures. Clin Implant Dent Relat Res, 2016. 18(3):498-506. 5. Degasperi W et al. One-year clinical and radiographic results with a novel hydrophilic titanium dental implant. Clin Implant Dent Relat Res, 2014. 16(4):511-9. 6. Di Lallo S et al. Resonance frequency analysis assessment of implants placed with a simultaneous or a delayed approach in grafted and nongrafted sinus sites: a 12-month clinical study. Clin Implant Dent Relat Res, 2014. 16(3):394-400. 7. Davies J. Dynamic Contact Angle Analysis and Protein Adsorption. In Davies J (Ed), Surface Analytical Techniques for Probing Biomaterial Processes, CRC Press, New York, 1996.